Over the last 15 years or so, the study of polarization has become quite important for several reasons. Some of the major reasons are its role in analyzing the income distribution evolution, social conflict, and economic growth. Broadly speaking, polarization is concerned with appearance (or disappearance) of groups in a distribution. In politics, it is regarded as a process that leads to division of public opinion and movement of the divided opinion to the extremes. Likewise, one notion of income polarization, which we refer to as bipolarization, is concerned with the decline of the middle class. In this case, the relative frequency of observations associated with the central value of the distribution is low compared to those in the extremes. Polarization in this case is measured by the dispersion of the distribution from the central value toward the extreme points. 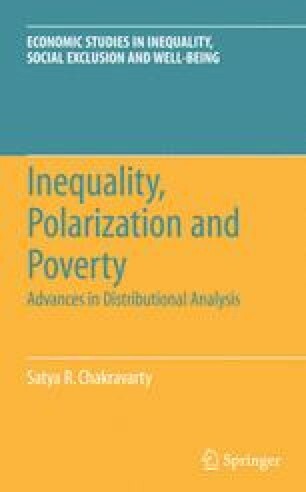 The principal reason for looking at polarization this way is that a large and wealthy middle class contributes to economic growth in many ways and hence is important to every society. The middle class occupies the intermediate position between the poor and the rich. A person with low income may not be able to become highly rich but may have the expectation of achieving the position enjoyed by a middle-class person. Thus, such a person is likely to work hard to fulfill his expectation and unlikely to revolt against the society. Therefore, a society with thriving middle class contributes significantly to social and political stability as well. In contrast, a society with high degree of polarization may generate social conflicts, rebellions, and tensions (see Pressman, 2001). Therefore, in order to avoid or reduce such possible risks, it is necessary to monitor the situation in the society using indices that look at the spread of the distribution from its center. Bipolarization indices have been investigated in details by Foster and Wolfson (1992), Wolfson (1994, 1997), Wang and Tsui (2000), Chakravarty and Majumder (2001), Rodriguez and Salas (2003), Duclos and Echevin (2005), Amiel et al. (2007), Chakravarty et al. (2007), Silber et al. (2007), and others.